Corn traded lower on the overnight session with beans flat to mixed as the market awaits the release of the notorious January USDA report out at 11 a.m. this morning. 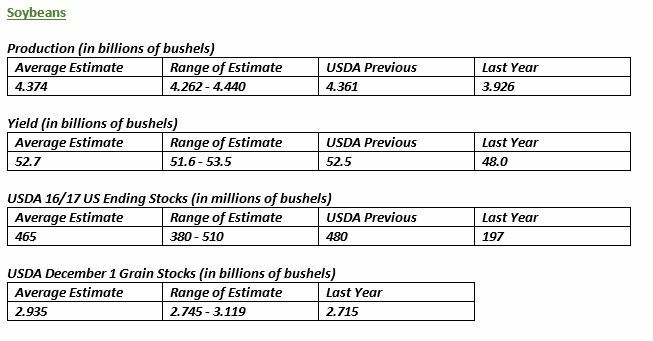 The January report typically adds volatility to the market since we get updated S&D Estimates, finalized production from this past harvest, and an update in Quarterly Stocks. 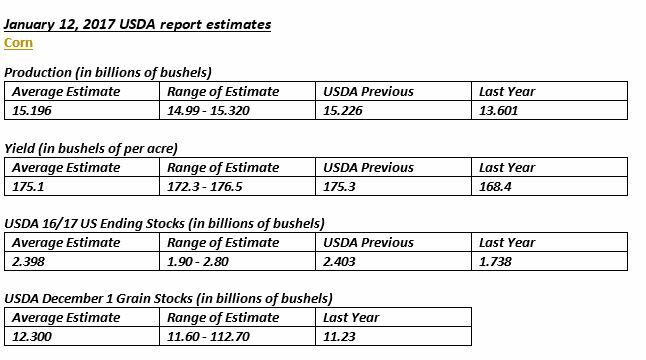 See below for trade estimates. Wednesday’s market was a little volatile – corn found itself at one point down 6 ¼ cents but finished up the day only down a penny. China issued new tariffs on imports of DDG’s which will have an impact on what the U.S. is able to export. The EIA report yesterday showed a new record again this week at 308.4, which was 3.4 million gallons above the top end of projections. Beans also traded as low as 13 cents down on Wednesday’s trade but recovered and finished off the session at 2 ¼ cents down in nearby contracts. Crude oil currently trading 80 cents a barrel higher, palm oil futures are trading firmer, and the dollar is sharply lower, trading just under the 101 area. Outside markets are generally favorable towards the our commodities sphere so far today.